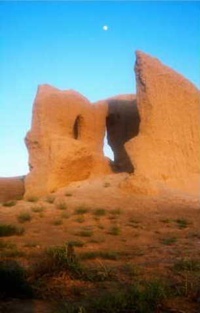 This is a story of the Silk Routes of Western Turkestan, of the deserts through which they were driven, and of the cities which define them; of journeys through space and time, through deserts, mountains and millennia; and of a solo journey on horseback along the fringes of the Kara Kum, or Black Sands, of Turkmenistan. 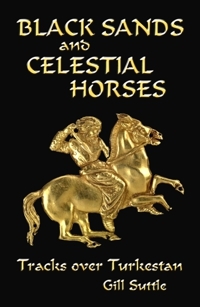 It is also a story of the Turcoman Horse, whose forebears were Sacred to their early breeders, the Persians; while the Chinese Emperors who desired them called them Celestial. These two themes cannot be separated; for the second inspired the first, and you may not search out one without stumbling across the other. One such horse enters the story and makes it his own: a horse who prints his personality deeply upon the journey, a horse ultimately destined to travel further afield than most of his illustrious ancestors. This story is peopled by heroes and villains, from Alexander the Great via Genghis Khan to players in the Great Game; but its greatest heroes are the ordinary people of Central Asia today. They enable a uniquely unrestricted view of old and proud lands, seen in a brief moment between the collapse of the USSR and the rapidly closing doors of new, even more controlling regimes.